As a gamer, you know that new games never stop coming out. Likewise, they’re always pushing limits of hardware capabilities. Also as a gamer, you understand how amazing it feels when you upgrade your computer. Whether you install upgrades through a computer repair company, or do it yourself, the feeling when you first turn on that freshly upgraded computer is awesome. However, a dark shadow looms over gaming computers right now. That shadow is cryptocurrency. Over the past year or two, cryptocurrency has been seeing another meteoric rise. Unfortunately, with that rise has come a surge in demand for high-end video cards. Both AMD and NVIDIA GPUs have been flying off the shelf as fast as they’re put up there. That’s even with the skyrocketing prices. Because of this, unless you really need to upgrade your computer, you should wait on buying a new graphics card. What Does Cryptocurrency Have to Do with Gaming? Cryptocurrency isn’t related to gaming directly. However, newer currencies like Ethereum are making good use of gaming GPUs for "mining". The first cryptocurrency boom led to a similar situation; however, it is worse than before. 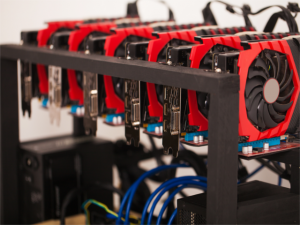 Cryptocurrency miners are all racing to expand their mining operations while cryptocurrencies go through this boom, and even for them, the GPUs are the main bottleneck. This means that if you’re just an average user looking to upgrade your computer, you might be out of luck for a while. The sudden demand for gaming cards only hurts the PC Gamers. If you’re a miner looking to upgrade your computer for mining, you’ll earn your money back. But if you’re a PC gamer looking to upgrade your computer for gaming, it’s just an expensive purchase. Even the GTX 1060 can cost nearly $800 depending on the manufacturer and model. That’s a two-year-old graphics card, and the launch MSRP was $249. If you’re trying for a one-year-old card like the GTX 180Ti, you could spend up to $1500. The GTX 1080 Ti carried an MSRP of $699 on March 10, 2017. AMD cards don’t fare much better. The AMD RX Vega 56 released in August 2017 with an MSRP of $399. Today it carries a $1000 price tag. The Vega 64 launched with an MSRP of $499, and you’re looking at $1200 now. If you’re trying to upgrade your computer, the future might not remain as dark as it seems now. Rumors are floating around that AMD and NVIDIA are both working on graphics cards that are specifically for cryptocurrency miners. These graphics cards would be a little cheaper MSRP than the gaming cards, and they would come without display connectors; useless for gaming, perfect for mining. If you are trying to upgrade your computer, or want help making your computer last longer, the pros at Tech Studio Mac and PC Repair are here for you. Call (310) 392-3858, or visit the website to see what Tech Studio Mac and PC Repair can do for you.